In the world of HD trucks, off-road equipment and stationary power sources, the emphasis is always on more - more horse-power, more digging power, more break-out force, more hauling capacity and more generated power. When the demand for more is met, the systems that operate collectively to allow this increase in power are put under new burdens as well. As engines are designed to produce more power, the amount of heat generated increases proportionately. Cooling system design engineers are constantly faced with the chore of keeping operating temperatures under control. If a cooling system lowers the operating temperature too much, an engine will produce less power. Every engine has an "ideal" temperature at which optimal power is obtainable. Cooling systems really have a marked task of maintaining a balance of temperature and power. When you hear the phrase "HD cooling system," you're hearing more than radiators, hoses and fans. HD cooling systems can consist of oil coolers, intercoolers and charge air coolers in addition to radiators and fans. Other areas included in the total cooling system are the A/C and heater components and any add-on coolers to assist in rejecting heat loads from auxiliary or supplemental equipment. When a tri-axle dump truck or tractor-trailer is coming up behind you in the mirror, what do you see first? Grille -12 sq. ft. of it. The reason for the huge grille is the need for maximized airflow. Hidden behind these majestic chrome shields are A/C condensers, charge air coolers, oil coolers and radiators. The grille area must be large enough to introduce adequate airflow required to cool three or more layers of cores, all competing for cool air. 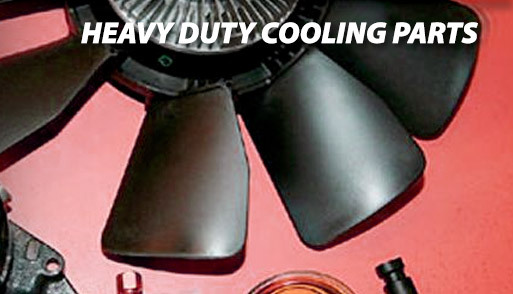 Cooling fans play an extensive role in the operation of a heavy duty cooling system. Over-the-road trucks are equipped with fans utilizing clutches that are operated by air pressure. The fan clutch needs 100 - 120 psi to operate correctly. The air pressure is used to engage a friction disc which transfers torque to the fan. If the truck does not develop proper air pressure, the fan clutch disc will slip and the fan blades will not spin at the speed necessary to provide proper airflow. Horton's DriveMaster fan is being offered on the Sterling trucks model A9500 with the 12.7L Detroit Diesel engine and their Cat 3126 and C12 engines. These particular fans are equipped with a fuse system that warns an operator of oncoming problems and the fuse blows out from an overheating condition, preventing costly damage. According to Horton there are three situations that can lead to a blown fan fuse: 1. Fan clutches used beyond capacity; 2. Improper air pressure to the fan clutch; and 3. Improper new fan clutch conditioning. The cooling fan must be maintained regularly as part of the cooling system. This includes checking the condition of the blades (check for cracks or nicks) as fan blades that are not balanced can set up harmonic vibrations that can destroy water pump bearings and other related components, leading to total system failure. The fan clutch in the spline area on the friction disc must be free of dirt. An accumulation of debris between the disc and the air chamber can result in the fan not disengaging completely, causing slippage and a blown system fuse. Listen for air leaks in the clutch area while manually engaging the fan clutch. 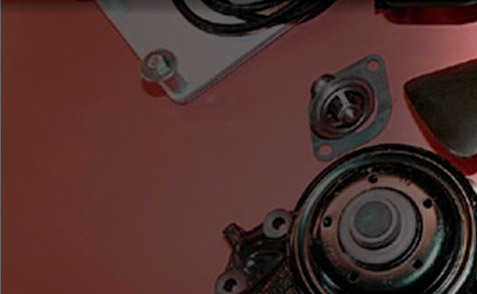 The belts must be tightened to specifications and the radiator fins must be free of dirt and debris. Construction equipment has utilized reversible fans for many years. The secret or mystery comes in to play in deciding when to use a blower fan and when to use a suction fan. This all depends upon working conditions, especially when dust becomes a major concern. A blower type fan typically keeps an engine compartment approximately 50? F cooler than a suction fan. Blower fans are recommended when destructive materials are present and could be pulled into the radiator by a suction fan. The air temperature being introduced to the radiator core is much higher when a blower fan is used as the air is drawn past the engine and other hot components. Blower fans require more fan-to-core clearance than do suction type fans. Fan position and shroud design is very crucial to the operation of a cooling system. As a rule, engine coolant temperatures will not reach the point of thermostat regulation (normal operating temperature) under light loads or in extreme cold conditions. This occurs when a thermostatically controlled radiator shutter should be installed. An additional controller must be used if a charge air cooler is part of the system. This unit will open the shutters in the event the temperature of the intake air out of the charge air cooler is too high. Winterfronts are designed to block off enough airflow to cause an increase in coolant temperature, allowing the system to reach normal operating temperature. These devices should never cover the entire grille opening - 25% of the center grille area must remain open, otherwise coolant, charge air and engine oil temperatures become extreme. The recommended opening size will vary according to these additional factors: ambient air temperature fluctuation, increase or decrease in load, vehicle ground speed, altitude, ice and snow build-up, wind chill factor and the overall condition of the cooling system. The normal recommendation for a radiator used for HD applications is a bolt-up, copper/brass unit. In really severe conditions, a radiator utilizing steel tube protectors and steel fins is highly recommended. Aluminum cores are used in many of the same applications, however these units are much more vulnerable to corrosion and erosion caused by high coolant flow speed and damage caused by stress and vibration. If an aluminum radiator is used in a HD diesel powered application, a supplemental coolant additive (SCA) must be used in conjunction with a low silicate coolant. If incorrect coolant is used, the result can be engine failure due to pitting and erosion of the cylinder liners. A quality SCA will contain additives designed to reduce corrosion in aluminum radiators when used with a low silicate coolant. Thin radiator cores with large surface areas are usually more efficient than radiators with a smaller surface area and a thicker core. In HD applications, there are two basic core designs that are used: a serpentine-type and a plate-fin design. Radiators with a serpentine type fin are not as impervious to plugging and physical damage as the plate-fin type. This type of core is more suited for clean operational environments and/or stationary applications such as generators and pumps, compressors and maintenance equipment. Any application not subject to large amounts of airborne trash or physical destruction is ideal for this type of radiator. On the other hand, a plate-fin radiator is less likely to become plugged by airborne particles and is not easily damaged. This radiator design is the most common choice for construction equipment, off-highway trucks, agricultural and forestry equipment applications. Fin density (spacing of the cooling fins in the core) is crucial to the radiator's being prone to blockage and simplicity of cleaning. For applications such as agriculture, forestry and construction, fin density would be around 6-8 fins per inch. This provides for easy cleaning and fewer occurrences of plugged cores. A fin density of 12 or more fins per inch is well suited for cleaner operational environments. There are various cooling system issues to be dealt with in view of the fact that manufacturers of OTR trucks are constantly striving to reduce air drag and improve fuel economy through bold, aerodynamic slipstream designs. The new shape of outer skins has required engineers to make an equal number of ingenious alterations under the surface, allowing sub-systems to exist, and with improved efficiency. The Peterbilt Model 387 advocates a new approach - engine-mounted, side by side charge air cooler and radiator for improved cooling and increased fuel economy. The cooling system connections are made with hi-temp silicon hoses. The 387 also has hood mounted fender liners that tilt out of the way for easier servicing of the A/C and cooling system components. Kenworth's T800 is available with power plants ranging from 250 to 550 horsepower cooled down by a high capacity 1,520 sq. in. radiator with a core thickness of 2.25". Inlet and outlet sizes are 2.5" coupled to hi-temp silicon radiator hoses for extended service life. Other features include HVAC ducting that has been integrated into the firewall assembly, providing increased airflow and easier access for servicing. The Freightliner Argosy features a Cummins 370 horsepower diesel, cooled charge air and a radiator offering 1,100-sq. in. of cooling. The redesigned HVAC system provides constant cooling and heating through the entire cab area. A booster unit for the sleeper keeps the interior temperature level, even though outside temperatures vary from -20? F to 110? F. The Century class features a driver message center providing warnings for such conditions as low oil pressure, low coolant level and high coolant temperature. Freightliner's Condor is a low cab forward design engineered just for the residential and commercial refuse industry, and is powered by Caterpillar or Cummins, from 275 to 380 horsepower. The Condor features a 1,116-sq. in. radiator as standard equipment or a 1,100-sq. in. unit with provisions for an engine PTO. The Columbia model features a 1,000-sq. in. radiator as standard equipment - a 1,350-sq. in. radiator is optional - mounted in the front frame and cross-member. Radiators and tap water don't go together because the magnesium and calcium found in most tap water can cause scaling on cooling system components. Corrosion of engine and cooling system parts can also result from the presence of sulfates in tap water. Distilled water should always be used when filling a cooling system to help avoid all of these conditions. Maintain a 50/50 mix of water and coolant in all cooling systems. If the percentage of antifreeze is too much, the coolant can gel and lose all effectiveness. Cummins has done tests and has discovered that more than half of all water pump failures is caused by over-concentration of antifreeze in a cooling system. Use a supplemental coolant additive to control the level of pH and foaming as unbalanced pH produces acidity and scaling and foaming causes pitting and erosion of cylinder liners and other internal engine parts. No matter what type of antifreeze you use or how strong of an additive you use, gasses and acids cause a breakdown in antifreeze. Even though regular replacement of water filters helps in the battle against coolant breakdown, Caterpillar and Detroit Diesel recommend draining and flushing a cooling system once a year. Mack Truck recommends a flush and fill at least every two years. High quality, silicon coolant hoses and heater hoses are found on the majority of OTR and HD trucks today. Yet cold water leaks are still a major problem faced by the trucking industry. Here's what happens - as temperatures rise in the cooling system, the water necks that the coolant hoses connect to expand from heat. Unfortunately, the hoses and clamps expand at a different rate. The clamp does not allow the hose to expand as much as the water neck. The elastomer in the hose wall conforms to the size of the expanded neck. As the coolant temperature drops after engine shut down, the water neck contracts and the seal between the neck and the hose diminishes. As this process is repeated time after time, the hose-to-neck seal is completely lost, resulting in water leakage at the hose connections as the system cools down. For the time being, the best way to deal with cold water leaks is by using constant torque hose clamps, cleaner surfaces on water necks and silicon hoses. Many engine manufacturers have approached the problem by designing in the replacement of hoses with metal tubing and o-ring fittings. Blue Stripe hoses by Gates can offer long life, reasonable pricing and fewer problems through the use of Ethylene Propylene Diene, a rubber compound that has great sealing characteristics to provide a better bonding action between the hose and connections, thus reducing cold water leaks. Flexfab introduced 3-ply and 4-ply coolant, heater and charge air hoses all made of silicone, reinforced with polyester and coated with a special elastomer. Flexfab offers a 1.5 million-mile warranty on their new hoses. There are still problems in the clamp department. Some brands stretch during the expansion of water necks and hoses, never returning to their original size to maintain a torque tightness on the connection. Other clamp designs fall short due to torque screws that tend to back off and even undo clamps completely. Clamping problems are being worked out, however. Gates has brought us the PowerGrip thermoplastic clamp designed to be compatible with rubber wall and silicone hoses. This non-metallic hose clamp is installed by using a heat gun - the thermoplastic material maintains torque - and never needs to be tightened after installation. As engine temperatures fluctuate from normal operating range to a cold shut down temperature as low as 40? F, the PowerGrip clamp has a sort of "memory" - the tightening capacity at the connection actually increases and eliminates cold water leakage. The Pintite SS hose clamp features a locking assembly that averts loosening under vibration. This is a combination of crimp-on, spring and continuous tension style clamp, with a worm gear design. A cotter pin is used to lock the screw into position, preventing the screw from backing out and loosening the hose connection. Electrochemical degradation (ECD) is another culprit to watch for when looking for coolant leaks. An electrical current generated between unlike materials - hose and water neck or hose and radiator - causes this condition. ECD triggers the development of small cracks inside the hose lining. Coolant then attacks and obliterates the internal layers of reinforcing material. As A/C systems are converted from R12 to R134a or R22, the adaptation will need to include new hoses and fittings. R134a molecules are many times smaller than R12 molecules. This presents a problem as - R134a filters through nitrile A/C hose material at a much faster rate than R12. New replacement hoses are designed with an internal nylon barrier. Dynacraft offers A/C hoses for R134a systems that have a barrier consisting of five layers, a rubber liner and outer cover. These new hoses can handle temperatures to 275? F. Gates has its PolarSeal hose for R134a systems, featuring a nylon inner barrier intended to prevent refrigerant from seeping through hose material. Construction equipment and off-highway trucks encounter the same cooling quandary as OTR trucks: heavy, protective grille-guards are installed to shield components similar to those hidden behind OTR truck grilles. Radiators for these applications will usually measure out at 1,200 to 1,500 square inches. This total area is what's required for cooling high horsepower diesels turning out full power at low ground speeds. The airflow through heavy equipment grille-guards is as crucial as airflow through commercial truck grilles. The enormous measure of dirt and debris, which accumulates in the front or rear grille-guards of heavy equipment, is very detrimental to the cooling system. One added factor, which is unique to heavy equipment and off-highway trucks, is low ground speed - much too slow to force air into the radiators and coolers - and very high engine speeds which can heat the coolant to dangerous levels. This puts a tremendous load on cooling fans and radiators, oil coolers and condensers. Manufacturers such as Kenworth, Peterbilt, Mack and Ford are offering over-sized radiators in their heavy-duty and off-highway trucks to compensate for the increase in coolant temperatures caused by a decrease in vehicle speed and airflow. Most of these larger trucks are being built with aluminum mounting frames for the radiators and charge air coolers, mounted directly to the front frame crossmember. Others are boasting side by side radiators and charge air coolers, mounted directly to the front of the engine. Articulating dump trucks built by Volvo, John Deere, Caterpillar and Terex all face the same obstacles when it comes to keeping things cooled off. These off-road haulers never operate in clean, dust-free conditions. Humidity and dust form a coating on radiators, charge air coolers and oil coolers, which cuts down on airflow and heat transfer tremendously. As a result, operating temperatures soar into the danger zone. The only way to combat this problem is to power wash the radiator and coolers on a very regular basis - every few days. The issue of additional heat load from auxiliary systems on heavy construction equipment, off-highway trucks and stationary equipment continues to be a major concern. Charge air coolers, engine oil and transmission oil coolers and hydraulic oil coolers are all being utilized to the fullest. Heavy equipment, supplementary attachments and systems for powering these attachments produce heat in one form or another. Charge air coolers are used to cool intake air on turbo-charged engines. These units are usually mounted in front of the radiator and share the airflow created by the cooling fan. Air drawn through a charge air cooler does not cause a decrease in radiator performance although it will decrease the amount of airflow available to the radiator. As mentioned earlier, one approach to eliminating an airflow problem is to mount the radiator and charge air cooler side-by-side as one cannot have a negative effect on the other. Oil-to-water coolers are built into either the bottom radiator tank or spliced into the lower coolant hose as a shell and tube type cooler. Although this type of oil cooler increases the BTUs in the coolant itself, it does not have a great effect on the operation or efficiency of the radiator. Another option is to employ an oil-to-air cooler, which is mounted in front of the radiator. If a blower fan is being used, the cooling air temperature to the radiator will not be adversely effected. There is, however, a restriction in airflow through the radiator as a result of the oil cooler's being mounted in front of the radiator. The use of a suction fan will improve the cooling of the hydraulic oil because the cooling air passes through the oil cooler first. In this situation the radiator is receiving pre-heated cooling air from the oil cooler. This does affect the performance of the radiator.